Let’s have a conversation about water and energy. We know that the two resources are connected: We need water to produce electricity, mostly for thermal power plants (though we are going to put that aside today). We need energy to pump water out of the ground, treat it so it is potable, and then re-treat it after we use it to shower or wash clothes. We also need energy to heat water in our homes, businesses, and industrial facilities. Recognizing these intersections opens up opportunities for utilities and businesses to save more energy and conserve more water, while helping policymakers and regulators design more strategic and cross-cutting policies. How much energy does it take to get water from the ground, or a lake, or a mountain, to your house? And, after it goes down the drain, how much energy does it take to process that water so it can go back to your house, or back to its source? Well, as with most things, the answer is complicated. ACEEE has taken a stab at gathering some of the relevant literature and studies to get an idea of what the answer to that question is. In our new paper, Watts in a Drop of Water: Savings at the Water-Energy Nexus, we attempt to estimate the amount of energy required to move and treat water. 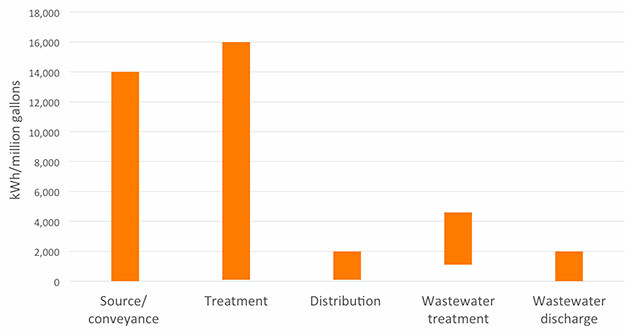 The ranges of water’s energy intensity vary dramatically, particularly in the water service sector (source, conveyance, and treatment). This is largely due to differences in size of the water systems, pumping requirements between geographic locations, and raw water characteristics. The chart below shows the ranges we gathered for the water system (excluding heating water in the home). What is the biggest finding? There’s a big opportunity for savings and a lot more work needed to achieve them. We need more raw data on the energy use by water and wastewater facilities across the country. Once there is more data we need solid methods to calculate energy savings from water conservation. If utilities want to work together with regulators to save energy through water, we need good methods for calculating those savings. We need pioneers. We need water and energy utilities working together to do innovative collaborative work across the country. We need to gather stories of success. Putting those pieces in place means a lot of work needs to happen, but the benefits, particularly in states facing severe droughts, would be huge. So let’s get moving!